Archpriest Sergiy Begashov: Do not remember the sins of my youth, Lord! Author: Metropolitan Agafangel. Date of publication: July 06, 2018 . Category: Author's column . Today, the Orthodox Church celebrates the feast in honor of the icon of Our Lady of Vladimir. This day, has always been for me a special day, because On July 6, I received the holy dignity. Today, this day has become even more significant for me, because fifteen years have passed since my consecration. 15 years is not much at all, but enough to think about, to turn back, to make some comments and conclusions. And these conclusions to which I have come today are due to the fact that five years out of these fifteen, I served in the ROCA. When we moved to our church from the MP, I was asked to write an autobiography and provide copies of decrees on ordinations and awards. But my carefree life as the head of a large family and as a rector-builder, as well as (which is a sin to conceal) a banal laziness, prompted me to move this tedious and embarrassing business farther and farther. How five years have passed, and I have not done what I promised. And although I already amended, but this very "correction" caused me even more embarrassment than the time that I indignantly dragged with this. (May forgive me m. Rafael). All this made me look back again, and try to somehow rethink my past. And now, looking at these fifteen years, I suddenly experience something that I did not experience earlier. I am ashamed! I was stained with this past. This hypocrisy, this pretense, this pseudo-humility and this pseudo-righteousness. I'm ashamed of the fact that I was part of this performance and that I desperately tried to find my place in it. I am ashamed that I saw lies, tyranny, blasphemy and outright lawlessness, and was silent, as it seemed to me then, to cover the "sin of my brother".I'm ashamed that I lied myself. He lied for the sake of "the benefit of the church." I am ashamed and I am guilty of believing in the "Russian world" and was himself an adept. What took these shameful 200grn then at the diocesan assembly of the clergy for "prayers" about Victor Feodorovich. I took it and wanted to get more. I am ashamed for the fact that I was a SLAVER, rejoicing and hating at the same time pressing on my throat, my landlord's boot. I confess that I convinced myself that this is the church. He knew that this could not be, but he persuaded. Both myself and others. And he seduced some. May God forgive me! Of course, five years, it's too little to see, to get rid of this slavish poisoning. Where I sin, because some old, incomparably stronger than me, it was not possible to overcome this in forty years. But that's what I see, it's enough to have vomiting in a desire to shake this past of myself to the end, in order to survive to live, and live forever. "And this is eternal life, that they know you, the only God and Jesus Christ, whom you sent," the great Lord and Savior, the Head and Founder of His Church and ours. Yes, unfortunately, in our church everything is not as it should be. And in our church there is a place of stupidity and craftsmanship, obscurantism and ritualism, superficiality and vices, third-transtvo and imperialism, BUT! In our Church there is something that I did not see before - there are believing people here, and what seemed absolutely impossible - even among the bishops! Here there is Truth and Freedom, and these two qualities are the qualities of the Holy Spirit, for the Comforter, the Spirit of Truth, instructing on all truth, where there is, there is Freedom. There's no need to invent something, hide something slyly. There everything is as it is. And thank God that He by His mercy brought me here. And now, in view of all of the above, let me, my dear fathers, brothers and sisters, just as the Mother of God liberated the Orthodox people from the yoke of their wicked image by the manifestation of their miraculous image, and by Her prayers freed from the yoke of my past wickedness. For I do not want to see, hear, know, or have anything from that past. Metropolitan Vladyka, I ask your blessing not to be called to me again as an archpriest, not to bear any awards, nor to remember them, and to consider them for nothing, as though they had not been. 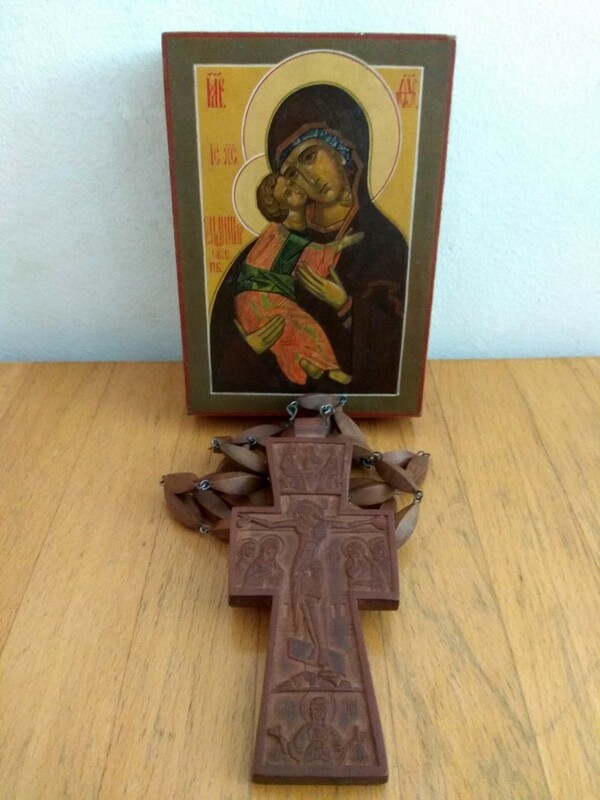 I only ask permission to wear my modest wooden cross, which my maternal grandfather once donated (which remains, alas, to the MP), and then, just because I have no other priestly cross. With gratitude to God, His Church and her children, the saving servant of God, Priest Sergius Begashov, ROCOR. Priestly awards, which are lower in rank, are not taken away and are not abolished, every priest has the right to dress or not to dress everything that was given to him earlier. There is the grace of the priesthood, which has no ranks. As, by the way, and hierarchy.